Starred ReviewBefore she was the aged and stately Harriet Tubman we know from her famous photograph, she was so many things. The inspirational and determined life of Tubman is distilled into evocative vignettes reaching back to her childhood. So varied were her roles that the casting of multiple narrators not only adds texture to the production but helps reinforce that each role had its own set of challenges and its own place in her life. Each of the four narrators reads with a clear, convincing voice and employs tones befitting the role she portrays. January LaVoy brings a gentleness to her lines about Tubman's time as a nurse; Johnson is bright and optimistic voicing Tubman's early years; Lisa Renee Pits employs a boldness and tension while describing Tubman as Moses; Bahni Turpin brings a note of awe to her sections. Sound effects are well used and specific—it's not just crowd noise but a crowd at a a suffragist event; it's not just the sound of water but the sound of water slapping the side of a boat in motion. 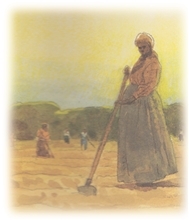 Particularly evocative is the section featuring an indistinct song of enslaved men in the background, accompanied by the rhythm of shovels hitting dirt. Subtle tone-setting music provides an additional layer of richness. A page-turn track employing the gentle sound of pages turning is included. The final passages are deeply affecting and will resonate with listeners young and old.